﻿What does recycling mean to you? For many, it conjures up images of compost bins or newspaper and bottle collection days (and possibly a seven in the morning dash because it wasn't left out the night before). However, it's a word that applies equally to styling the clothes in our wardrobes. I've never been able to understand the behaviour of some affluent individuals who can afford to buy something and parade it once, before discarding it again. For me, part of the joy of dressing is discovering new ways to style long owned items. It's not for nothing that articles are written about ‘versatile’ pieces. The term doesn't refer only to classic LBDs and white shirts that we all know are a ‘staple’ of any wardrobe, but also encompasses anything that can be worn time and time again (constantly being recycled and re-used) – like my vintage dress styled above. This is the third outing for the sixties silk beauty on my blog. No longer a blushing debutante; this dress is now secure in the knowledge that it is well-used and loved. (Is there a term, like anthropomorphism, that could be used to describe the personification of clothes? If so, I feel I'm in danger of using it). The dress’s Erdem-like abstract flowers have been previously dressed up with granny’s turquoise string gloves and silk stockings; and the print has also bloomed alongside a vintage seventies belt and Laura Ashley hat. It has appeared at the back of the Sunday Times Style Section, and now – in its biggest appearance to date – has been lucky enough to grace the pages of the newly published ‘Style Yourself’ blogger book. I was ecstatic when, last year, I was asked if I would like to appear in the Weldon Owen published book 'Style Yourself' alongside fashion blogging luminaries such as Style Bubble and Style Rookie. I hastily agreed, and then forgot all about it, as recovering from surgery took precedence. So imagine my excitement when I found out that it was published – and there was a copy winging its way to me from the United States. Now that I have the book in my hands, I can see other favourite bloggers – such as FrouFrouu, Louise Ebel and Barbro Anderson (alongside many, many others) – all featured in gorgeous and varying spreads. My own two pages come under the ‘accessories’ section, which features some images from ‘Wrinkled Silk Stockings on a Blustery Sunday’, presented with a very British ‘Tea Party’ spin. All I can say is that whoever had the bright idea to create this book was very smart indeed. Blogging is still a relative toddler in comparison with other industries, but it is growing faster than Jack’s beanstalk. These 95 bloggers presented have a collective 500,000 visits a day (thanks to Barbro for that fact!) – Hundreds of thousands of people logging on to see what their favourite bloggers have styled and written about. Cumulatively, that is a pretty large voice. The book itself is beautifully laid out and structured – full of tips and hints on styling – with ample inspiration. Whether you favour eighties Grace Jones style looks, or dress according to the landscape around you, there is something for everyone. However, one of my favourite aspects is the pages given over to the technical terms for every clothing-related item under the sun. Did you know what a fishing creel bag is, or what a Watteau dress looks like? (I didn’t, but I do now!) Or perhaps you’d like to discover the wonders of a zouave jacket? There’s something quite addictive about pinpointing exactly what type of shoes you are wearing (are they Oxfords, Brogues, Jazz or Saddles? ), and learning the exact dart shape used to create the dress hanging on a mannequin. It’s this level of detail, along with the delicious design, that left a huge grin on my face after I had ripped the packaging open. On this excursion, I styled the dress with coral pink shoes from a flea market stall, a Jaeger belt from ebay (second hand), and a green silk belt-tie worn as bow. The tiny vintage leather saddle bag and the lace top (worn under the dress) were both from my favourite local charity shop. These photos were taken about an hour ago, on the hottest day of the year so far. Yesterday I was sheltering from the rain and wind, and today I have been hiding from the heat. Now, in a final (magician’s) flourish, Weldon Owen has offered to send a copy of ‘Style Yourself’ to one reader of Clothes, Cameras and Coffee in a giveaway. I would like to open up this giveaway to bloggers and non-bloggers alike (as sometimes it just seems that only bloggers get a look in), with the same criteria. To enter, please answer the following – if you had to choose one item of clothing you own that sums up your style, what would it be, and why? (Eg – mine would probably be my sixties green and blue St Michael’s mini-dress, because it is vintage, immensely versatile, was bought in a charity shop and represents my love for all things whimsical). If you are a blogger, could you please comment with your answer and email address. If you are a non-blogger, I’d appreciate it if you emailed me with your answer, and ‘Style Yourself’ Giveaway in the subject line. I can’t wait to read some entries. Oh, and even better, the giveaway is open worldwide! The closing date will be the fifth of July. The book can be easily ordered from local independent bookshops (to help support local business – see Alexandra Therese’s The Demise of the Local Bookshop). However, it is also available on Amazon here. Great photo's my favorite post of yours so far! Mine would be my vintage Dr martens, they are unique, classic, rebellious, were a treasure to find and are all in all favorited my many fashionista's! Congratulations that is amazing! I'm not at all suprised that you are featured in it, your blog is one of those that I most frequently visit to see if it has been updated. This book looks amazing! It is definitely going on my wish list! If I had to sum up my style in one item of clothing it would most probably be my beloved blue boots decorated with three applique flowers down the side. They are beautifully boyish and tough, and add an edge to a girly outfit. And as I have unusually massive feet it is such a rarity to find shoes that I actually like, let alone love! And I know what you mean, I want to wear my clothes to death not wear them once and get rid of them! The item of clothing I own that best sums up my style would have to be a vintage royal blue playsuit with white arrows and stripes splashed across the front. It is without sleeves and simply has three white straps on the shoulder and the upper arm to prevent it from falling off. It's also quite unconventional as it wraps around the back and ties in a bow at the front. I feel this playsuit represents my style perfectly as it is bold, bright, very retro (pure 80s) and exudes cheerfulness! Congratulations on the feature, Roz! I can't wait to see your gorgeous self in the pages. The piece of clothing in my closet that best epitomizes my style would be my electric blue silk 1950's skirt. The nipped-in waist and enormously fully skirt demonstrate my fondness for romance and femininity, and the unexpected hue symbolizes my love of eclectically juxtaposing traditional and Avant-Garde elements. Wonderful! This book sounds amazing. I think if I had to choose one clothing item it would be a pair of black velvet trousers that I made for myself. The fit is perfect, the look is classic, but the velvet makes them special, a tad flashy, and ever so classic. I feel like I am channeling coco chanel when I wear them, but they can also take on so many other looks. I'm going to wait until, July 5th, and then if I don't win I'll buy the book ; ) oh and I totally agree, re-purposing clothing is so important. Great giveaway! And congrats, thats amazing! And difficult question! I think I would have to go with my light orange 40's dress because it was the first vintage dress I bought (since I was a teenager) and even though I don't wear it that often, it fits me perfectly and for me getting this dress was the beginning of a new phase in my life. Plus I got it in NYC while I lived there and it just means a lot to me. good stuff! congratulations on making the book. i've heard big things about it. The dress is showstopping on you! Mine is my silver glitter bow headband. It is very girly and glamourous but at the same time surprisingly versatile. I often use it to add a bit of bling to an outfit that would be fairly casual and simple without it. The book sounds fantastic, Roz. I would love to learn more about clothes, fashion and styling. My item would be a floral tea dress that I have worn through all seasons for over 4 years now. It has a tear down the side that I really should mend, and is currently rocking some safety pins. I love how it so subtly nips in at the waist but glides lightly over my hips. It is understated, pretty, comfortable and easy to style in all manner of ways. How lovely to be included in such a nice book! My favourite item of clothing is a silk top with a sequinned butterfly because it's a bit of an attention seeker but excellent quality. Because it's vintage it also has a backstory, and I have good memories from the times I've worn it over the years - such as for a presentation evening when I left school, on bad dates, good dates, when DJing at clubs... After ten years in my wardrobe, it's still going strong. Congratulations for the book! You totally deserve it! My ONE is a 20s silver gown which my great grandma used to wear at the time. It is very heavy and heavily beaded with deep open back. My grandma passed it down to my grandma but she never wore it. The dress was carefully stored and some years ago it started to have a new life. I found it, I was speechless and my grandmother was more than happy to pass it to me!!!!!!! It is so well preserved! Like new and carries my family history in a way!! Since the dress is very particular, I cannot wear it everyday but I it is getting great use for parties, weddings and important family events! It is my badge of honouring the family! My favourite piece of clothing is my sweet denim skirt which has a huge bow on the front. I love that its sweet and girly and can be worn with all my favourite tops tucked in or even with tights and cardigan in the cooler weather. Gorgeous outfit & stunning photos! Congratulations on being featured! I would say that my vintage rose-print skirt, with a lot of colour and pleats, sums me up. It's too short to be worn alone, in the way that I am not the most confident & usually have my hands clasping a necklace when I have to give speeches! It's quite colourful, and the more you look at it, the more colour and pattern you see. And it's not normal either. I'd say that my camel jacket is ME :) First of all because I'm a total jacket/ blazer person! Second, it's warm and I live up north so it's very useful. Third, I'm basic color person, so, camel/cream/sand is my color. The photo of you laying in the field is so lovely, you look so at peace. Hum, what item eh? That's a tough one. I think, as boring as it may seem, the item that most fits me is a green skirt I thrifted a while back. It'd midi length, so it is modest, but it is shape flattering and contour molding and ever so feminine. I can dress it up, and dress it down, wear it to frolic in fields or to the office. It goes everywhere and does everything, like me! Plus, deep forest green is my favourite colour. Well done for being included in this!! The item that I think represents me would probably be a simple pair of red shorts! I picked them very cheaply from a charity shop near my home, they are slightly quirky and yet infinitely versatile! I wear them so much, most of my friends identify them as being 'me' :) They are also very comfortable and practical...always preferable! Couldn't agree more about recycling clothes - I read an article entitled "Facebook fashion: Don't get tagged in the same outfit twice!" or something to that effect with general mystification yesterday (the trick is to wear your favourite clothes with different clothes! Who knew?). I would have to say my grey stripy Uniqlo Tshirt, largely because I wear it more than any piece of clothing ever. Also because I bought it for £3 (and I would still go giddy over bargains if I won the lottery tomorrow), it's grey (which is my favourite colour, despite not really being a colour, apparently), and it is Tshirt-y and comfy, but has ruched-with-shoelace-bow sleeves, which makes it a little bit pretty. I am what is technically termed a "lazy" dresser. I have to say, I LOVE the shoes with this ensemble! And what a great and fun opportunity :) Congrats! Oh, congrats on the book Roz ~ it sounds great. I would love to get my hands on a copy... *fingers crossed* I would have to say that the item of clothing that sums up me and my style would have to be a pair of shoes I own. Do shoes count? I sure hope they do, because although I love my clothes, it is the shoes that I am really addicted too! This particular pair is a black court style pump with a white ruffle trim all around the edge and a white bow on the toe. I love these shoes and I feel like they are a perfect representation of me ~ girly, quirky and different. I love to have fun with the way I dress and I think these shoes say that!! Such lovely pictures! You look great! Who doesn't love a silk dress? Especially when the floral print is so gorgeous as yours. 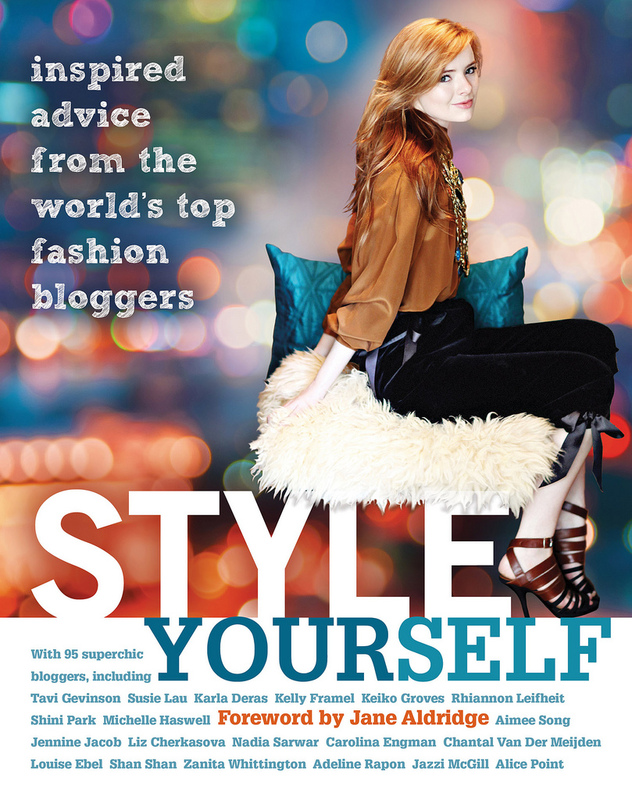 Congratulations on being featured in "Style Yourself" - I'll have to get my grubby mitts on a copy and have a read. When I go on the rummage I always end up looking for pieces that are going to work hard in my wardrobe and be versatile! The piece that I would pick as summing up my style would have to be my 70s pleated tennis dress, largely because it ticks this very important box. And it has broad bright orange bands at the shoulders and hem, thus satisfying my lust for bright colours! It's sad to say that I'm not sure what my style is exactly. I don't have any special everday clothing that means a lot to me or that would sum up my style. I usually dress stylish but with a simple, easy vibe. My style that I always dream myself in is structured pant-suits, chunky heels, bohemian maxi dresses and skirts, crop tops, floppy hats, and blazers. I guess that's my grown-up version of my style that I'm waiting to grow into some day. so my dream item that would sum up my future grown-up style? A neon pencil skirt. "UNPREDICTABLE"
I am so pleased for you my dear Roz. I love your dress and that pic where you are one with the grass. You are my giveaway, I need no more. roz!! i lovedddd the previous post you're getting really good behind the camera! That book sounds fantastic and all the better for featuring the glamorous you. I love the print of that dress, the tie around your neck and your elegant pose. Congratulations Roz! That is wonderful, I was asked to appear in a book about how stylish people style there homes, we were both most disappointed when I had to to tell them I didn't actually have my own home LOL - I moved back in with my parents. Oh how exciting, well done Roz! You must be so proud, I will definitely have to buy a copy of this book. Fabulous Post. Love this outfit. The first pic is my favourite in this post. And hooray for being in this book. Mmmh, your question is quite hard to answer. I think my Tiggers shoes: comfy, versatile and with an edge. Yep, I think they are the right pick for this. Hi love - I adore that dress! I just pinned the first photo as a favorite look. And I'd have to say that the one item that sums up my style is ... probably the redesigned, red vintage shorts I'm wearing in this post here. (Also here and here!) They're thrifted vintage, which is my go-to, cost a few dollars, were reconstructed into modern wear, and can be worn with everything! Wow this is quite the challenge! If I had to pick just one I'd probably say it's my Barefoot Dreams Calypso Wrap sweater...It's highly functional, does multiple duties (sweater/wrap/blanket/scarf), is made from the eco-friendly bamboo, and looks super chic any time of year! Modern Glamor in the most practical fashion...sums me right up! Thanks for the giveaway sweets! I could see why that dress speaks to you...so pretty and perfect for you! We want you to know we moved to a new website and we hope you continue to follow and visit. your photos and styling are beyond amazing! i hope you could visit my blog sometimes.. following you now :) follow me too? What a beautiful book! Please enter me in the giveaway! I think the thing from my wardrobe that best sums me up is a bright red dress that I made myself from this pattern: http://www.colettepatterns.com/shop/ceylon. And that would be my diy grey shorts, just simple but perfect! Hello, I love English and Irish Carity Shops but in Spain we do not have something similar. My favourite cloth is an school coat bouth in Irland. One pound was the price. EEEK. Congratulations! You are so deserving. Seriously. Whenever I enter your blog, I feel like I'm entering a whimsical world of beauty and dress up and I ABSOLUTELY LOVE IT. Congrats once again! Wayyy exciting. Would love to inside the book, hehe. Congratulations! You definitely deserve the recognition you're getting. I didn't have to think hard to answer your question...In fact, I think I answered likewise when you asked us what was our favourite item of clothing on a previous post! The item which best sums up my style is a black, flower print ''peasant'' blouse with puffy sleeves that my mom made as a teen in the early seventies. I discovered it in our cedar closet at the time where I was just figuring out my style and tastes (about 14 years old), which just so happened to be at the same time where I fell COMPLETELY in love with the Beatles. Reading about them and seeing them in pictures and movies is really what forged my style. My style isn't limited to the sixties/seventies, I do love victorian-style blouses and fitted blazers, but I always feel great wearing things that my mom would've worn at my age. So, this particular piece sums up my style because it was sewn (and actually sparked my interest in sewing..the first item I made for myself was a similar blouse), reflects my tastes in music, is vintage and second-hand ( this is the first item of my mum's that has been passed on to me...I've discovered countless items of hers in that cedar closet since! ), and lastly, because wearing it for the first time at that age made me realize that I really didn't identify with that decade's music and fashion (well, it was 6 years ago), and that I shouldn't be afraid to wear what really makes me feel like myself. Phew, I'm so sorry if I bored you with this essay of a post. Anyway, wow, I just realized that this blouse may have had a LOT of influence on the person I am today, what with my abhorrence of mass production and such! I would actually pick my purse/camera bag. It's vintage, and hand made. My mum's great uncle made it in Poland many years ago as a camera bag for her. It's leather, and when I rediscovered it, I sewed padding for the inside and it's now my own camera bag. It's a piece I pick because it used to be my mum's (like so many other things I love), is vintage, and leather...one of my favorite things.